I want to send you a picture for the "Reader's Spotlight" segment. Let me know what u think of this outfit. I am wearing a combination of checks with stripes. I would have never thought of wearing these two prints together before I started reading your blog! a) I think you look super cute. b) I love the clash of prints AND the clash of colors. I would like to Thank everyone who has sent their pictures for the Reader's Spotlight. I will continue to post them every Friday in the same order that I have received the email. For all the new followers, this is the segment where my readers get to share their style or ask of suggestions (if they need any!) from all my readers. So if you have been inspired by my blog then Email me your outfit pictures for this feature. If anyone wishes to stay Anonymous just say the word! This outfit is fabulous and full of fantasy! I adore that shirt + turquoise socks! 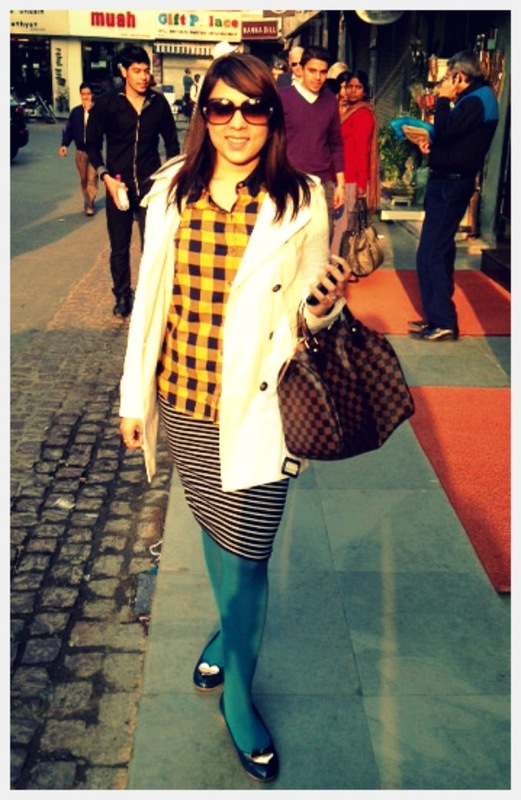 The colored stockings and mix and match of checks and squares is indeed brave ! Perhaps a light colored/ or monotone bag might have been better- again I am not very sure- just a suggestion ! Absolutely love the colours and mix and match of patterns. She does have courage to wear such a thing and that too so well! super cute n very chic richa and congrats for wedding n happy married life girl.. The overall look is great too! Reader's spotlight is such a cool feature you've added on the blog, Kudos!! She's super brave. Not many would brave such bold choices. I heart her flats too. i think she looks fab and she's as fearless as you are with her use of colours and mixing of prints. love the look! The ballerinas are super cute! I love her bold and funky style! So sweet! Love the colors and matching of patterns. I agree with saying,you need to be extra confident to carry those style elements! Its a jovious idea"READER'S SPOTLIGHT" of your blog.Love it. love her ambition in mixing prints. Super cute!! I like how the bag complements the top and then the stripes in a unique way balances the checks!